Liberia international goalkeeper Nathaniel Sherman has refused to give up on playing again despite having surgery on his right eye. Sherman suffered the injury in a freak accident after walking into a glass door earlier this month. The 24-year-old still cannot see out of the eye after treatment in India. "There's a possibility that I can get back on the pitch, but I cannot say anything in my present condition," he told BBC Sport. He spent eleven days in hospital after the mishap that happened as he was preparing to play for Liberia against Tunisia in a 2017 Africa Cup of Nations qualifier. "The doctors did not tell me anything about my career; after surgery, they then gave me medication that I have to take for another month," he said. 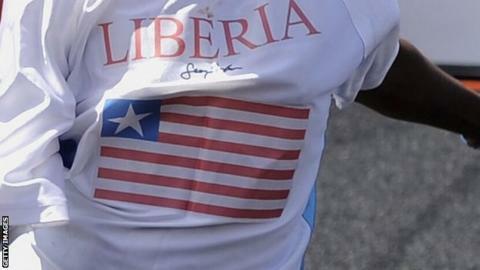 "I ask Liberians to keep me in their prayers; keep praying for me to get well. "Since I came back I haven't seen anyone from the FA - just some phone calls."